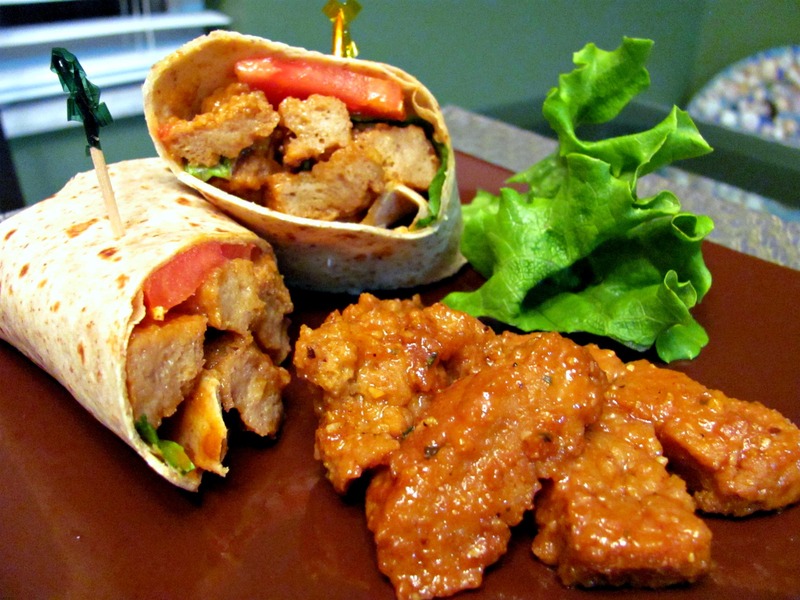 Seitan…what is that stuff? Wait, this looks like meat in the picture? Huh? Are you confused? I was AMAZED at how yummy this is! The texture is kinda different; it’s much like uncooked tofu, but the flavor was great. My husband ranked it pretty high on the scale! Making seitan is pretty…interesting, to say the least. What amazes me is that it’s basically just vital wheat gluten and water! I made it into patties, but since I had no clue what I was doing, I definitely would have made the patties smaller because it expands SO much when it boils. I had to add 1 cup of water like 3 times while it was boiling. It is kind of time consuming; it takes about an hour and a half to make the seitan (this includes sauteeing it in the sauce), but you can make large amounts of it and freeze it for later. I recommend making it into about 6 small patties, then as you sautee it once it’s boiled, cut it with the spatula into strips (as shown) while it’s cooking in the pan. This stuff would be great on top of a salad or on like a barbecue “chicken” pizza, or it’s just kind of good alone! Begin by putting your broth on the stove in a very large pot. Make sure it’s a big pot because the seitan will expand a LOT as it cooks and you will have to add water at least 3 times while it boils because of how much it grows. Add your onion slices, a pinch or two of ground ginger, additional soy sauce if you wish (about a couple tablespooons or more is what I added), and then however much poultry seasoning you wish. I even added in a little garlic and onion powder. Let it come to a boil as you mix the wheat gluten and water. In a medium mixing bowl, add vital wheat gluten. In a separate container (like your measuring cup), add 1 cup of water plus the 2 tbsp soy sauce. Add the water and sauce sauce mixture to the wheat gluten and stir. It will soak up the moisture really quickly, so you’ll need to discard the spoon and just use your hands to knead. Knead it a few times then let it sit for about 5 minutes, then knead it again. 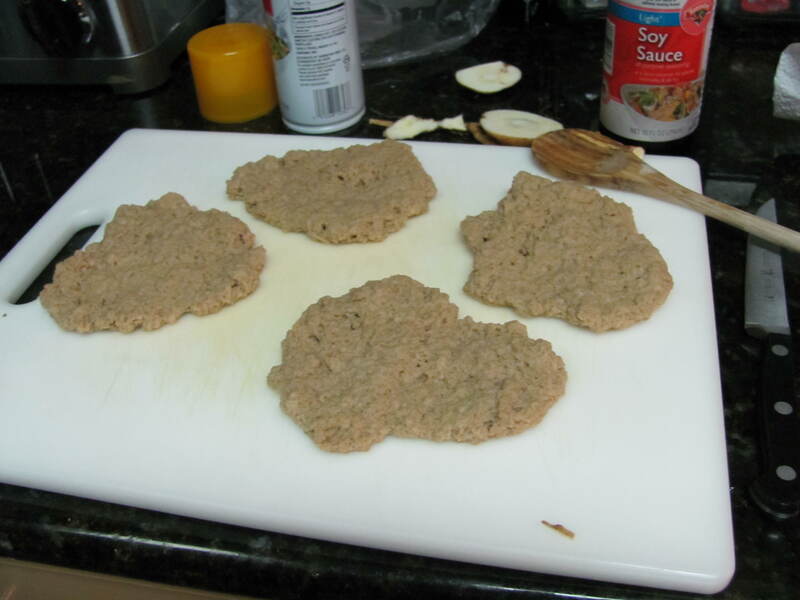 Separate the ball of gluten in about 6 pieces and flatten out into “meaty-looking” shapes (lol). Make sure it’s no more than 3/4 inch thick because you want to be able to cut it into slices as you sautee it. Place seitan pieces into boiling water and reduce to a simmer. Let it simmer for 45 minutes to 1 hour. When done, drain and cool. While cooling, heat oil in large skillet. 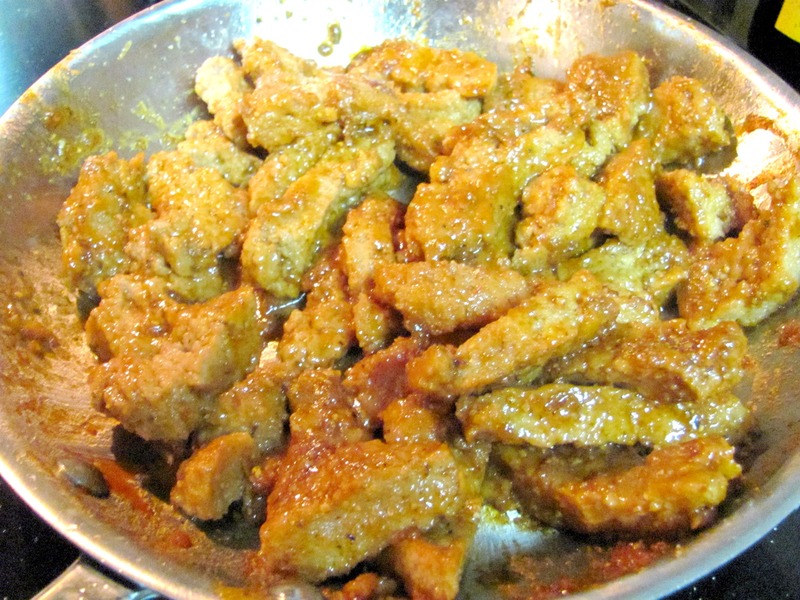 Place seitan steaks into the oil and begin gently cutting them into strips (as shown in the photo) as it browns. As it’s browning, add more poultry seasoning mix, more garlic powder and more onion powder. (I like a lot of bold flavor, so I added generous amounts of each spice). Once the pieces become slightly browned, add the barbecue sauce and sautee until some of the moisture from the seitan and barbecue sauce has evaporated. Add more barbecue sauce if you wish. Add the seitan and whatever sandwich toppings you want (tomato, lettuce, onion pickles, vegenaise, jalapenos, whatever!) and feast away!